SEYMOUR, CONNECTICUT: Mark M. Evenski, age 64 of Seymour passed away peacefully on September 17, 2018 - his guitar gently wept. He leaves his sister and friend Maureen Baldino (Bruce) and was predeceased by his dear parents Ziggy and Gladys Evenski and brother John Evenski. 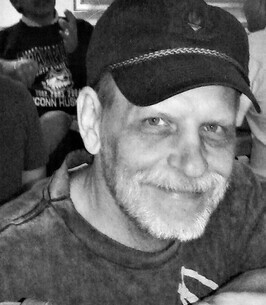 He was a cherished uncle of Tori and Mike Adamczyk and uncle/friend of Jeremy Baldino. As a true artist, Mark was a character who marched to his own beat. His life was his music… if he wasn’t writing songs, singing or playing guitar or piano he was reading about artists he loved. He had an extensive collection of rock memorabilia, concert ticket stubs and t shirts. He leaves thousands of cassette tapes; all of his gigs and bootleg tapes made by taping a microphone to the brim of one of the many baseball hats he always wore. He loved Hit Parade and Rolling Stone and saved years of issues. Mark's lifelong friends created music together for decades until the last jam session at CT Hospice, where they came together to celebrate his life and songs. Whatever life sent his way, he wrote about it…songs of love, loss and sometimes just pure nonsense. They changed band names too frequently to list. Mark worked at Branford Hills where he met many kindhearted and cherished friends. Daily he read the New York papers and played the lottery in the hope of winning big. He was an avid pen collector and enjoyed sharing them with friends. He constructed genius creations with cardboard, duct tape and newspapers. His beloved pets had crazy nicknames but their formal names were Wilma, Allison, Shadow, Sunny and RDJ. 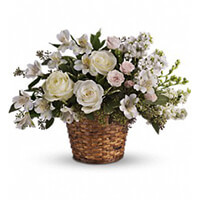 To send flowers to the family of Mark M. Evenski, please visit our Heartfelt Sympathies Store. This donation is made in the memory of my cousin Mark M. Evenski. My condolences to his sister Maureen in the loss of her brother. Mark was a wonderful person who will be deeply missed! Your songs will forever ring down the halls of Branford Hills! Thanks for the laughs, Godspeed, my friend. 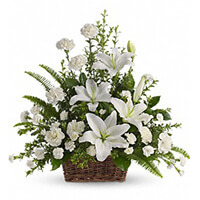 My condolences go to Maureen and the rest of Mark’s family and friends. Maureen has shown herself as an angel in her love and care for Mark and the rest her family through the years. She is such a wonderful person. I grew up with Mark during both of our earliest days. We were born within a month of each other and lived on the same street throughout our youth. Growing up together as boys we were as one. I think it takes a while before you even realize you are different from each other. We did an awful lot together. We went to each other’s houses at will and spent hours and hours just doing the things boys would do. His parents took care of me like family and mine took care of Mark as family. As we grew in years we continued to hang out in each other’s living rooms or bedrooms, now listening to just released records from the Beatles, Rolling Stones, Iron Butterfly or whoever else was making the music scene, over and over and over. Mark picked up a guitar around then and was a natural. He just got it and learned all the songs. Mark also read voraciously. It seemed he read a book or two a week, maybe a day. And the books were not lightweight. I recall titles from Solzhenitsyn, Hemingway, Dostoevsky. Really big books. Around junior high school we drifted apart. There was no ill will. We were going down different roads because that is how things happen, at times, in life. Through the years we would occasionally bump into each other and Mark always seemed upbeat. About 16 years ago I got to see and hear Mark play his music at an Oxford Center School concert. I had a feeling of great pride that Mark was my friend and remained so gifted with music and my kids got to see him play. I told Mark how happy I was to get to hear him and how great his music was. I always saw Mark as a person of good will. He spent many years caring for his parents and I know that was not always easy. I trust in the Lord’s mercy and grace, in Jesus the Christ, that Mark will continue on in the life-after to be in the wondrous splendor of perpetual light with those he loves and who love him, forever. May you be carried on the wings of angels to a place of peace and beauty, music and love. Thinking of your family and wishing you moments of peace and comfort.